It's black. Just kidding, it's not. 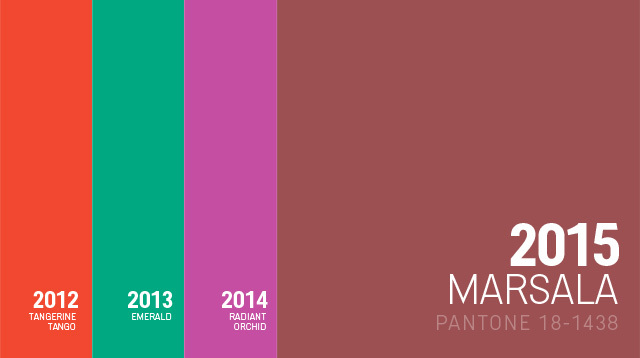 And the 2015 Pantone Color of the Year is...Marsala! "Marsala serves as the foundation to the Spring/Summer 2015 palette. Sensual and bold, delicious Marsala is a daringly inviting tone that nurtures; exuding confidence and stability while feeding the body, mind, and soul. Much like the fortified wine that gives Marsala its name, this robust shade incorporates the warmth and richness of a tastefully fulfilling meal, while its grounding red-brown roots point to a sophisticated, natural earthiness," says Pantone Color Institute's Executive Director Leatrice Eiseman. Why the color, though? The Wall Street Journal reports that "women are looking for bold neutrals to replace black," and marsala is that color. According to Pantone.com, the color goes best with glacier grey and aquamarine. We don't know about you, but we like marsala. In 2013, it was emerald green. In 2014, it was radiant orchid. And frankly, we've had enough of colors that scream Happy! Joyful! Fun! Cheery! Marsala reminds us of quiet Friday nights in the apartment, with a glass of red wine and a good book. And any color that reminds us of red wine is a good color.